Inca Trail permits are on sale now and going fast! Do you want to get into a forest? Climb a mountain? See natural landscapes? Meet the Machu Picchu? Well, there’s only one place in the world to do that, and it is located in Peru. But before you go online and start looking for your Inca Trail booking 2019, there are a few things you should know. What is the best time of the year to do it? All year long it is a beautiful journey to make, but you should know that there are five months a year that it is considered the high season, which is from may to September. If your free time is during those months, then you should make your reservation around five months in advanced, because there are not so many permissions issued by the Peruvian government, only 500 a day, of which only 200 of them are for the hikers. What about the rest 300? They’re for guides and professionals that work in the area. So you better start looking now for your Inca Trail booking 2019 if you want to go by next year. Is it time to reserve your place on this iconic trail to Machu Picchu. PERMITS FOR INCA TRAIL 2019 SEASON GO ON SALE THIS OCTOBER 1st. You NEED to secure Inca Trail Permits with the Institute of National Culture (INC) in order to hike the Inca Trail. 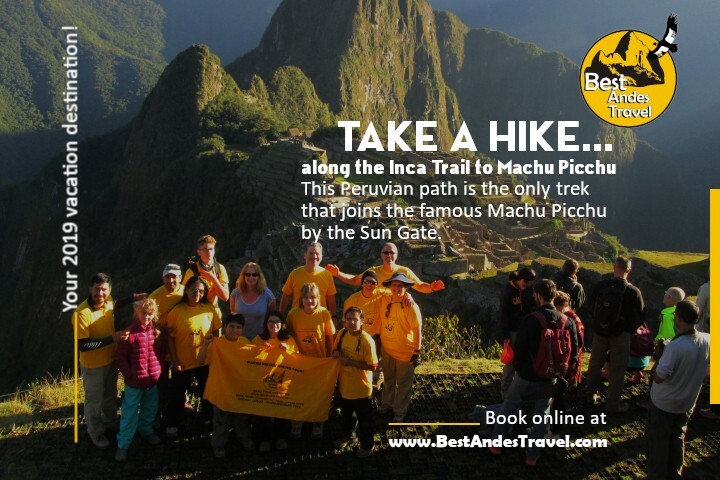 An official Inca Trail operator, such as Best Andes Travel, must do so on your behalf. The Inca Trail (7 via Salkantay, 5, or 4 days) is limited to 500 people per day (including guides, porters and cooks) which means that only about 200 – 300 visitors will be able to start this hike every day. Once I have booked my place on the trail, can I change my departure date? No. Unfortunately once your reservation is officially confirmed with the INC it is not possible to change or postpone your departure date. You would need to make a new reservation with a new deposit for your new date (this date needs to be one which is at least 5 days before or after your prior departure date). Please note that this is not an agency decision but a local authority regulation. ASAP. 2019 Inca Trail permits are on sale now and going fast. Book now to secure your place on one of the world’s most iconic treks. Shouldn’t I wait until October to book then? Unfortunately no, but by booking with a trusted company like Best Andes Travel, you are in the best hands to make this happen. For the last three years we have been 99% successful in getting everyone’s first choice for a start date. But giving us a back up or two for possible starts does help us make sure that you get to do this hike. We will always work to get your top choice and notify you if this doesn’t happen (which will not be the case). If we weren’t successful at all, which has NEVER happened, we will refund your money entirely – 100%. Why should you choose Best Andes Travel to travel with? We are a fully licensed agency that complies by the Peruvian Law. Apart from the formalities we are dedicated to changing the perception of tourism in Peru. How to Book this Tours? The best part about Machu Picchu and the Inca Trail is that there are so many options to do, that you can choose what to do and what not to do according to your travel budget. The definite destination must be the lost city of Machu Picchu, so make sure you are going to make the tour through the worldwide famous path made of stones and reach the city, which, by the way, is considered as one of the Seven Wonders of the Modern World. This is definitely a no. If you go to Machu Picchu, you’ll find all kinds of people, from all sizes, ages and aspects. This should be something you have to propose yourself. It is somehow a challenge on its own, the Inca Trail, but it eases on you while you get more into it. At some parts it can get harder, but then you’ll find yourself in the Peruvian plains, and it is a pleasure. So, let’s get to the point: no, you don’t have to be a professional to do the Inca Trail, but you have to be in good shape, either in your body or in your mind, because it can break you if you’re not ready. How do you get to be part of this journey? There are several options. Just have in mind you won’t find a place for tomorrow. Be prepared, in advanced. For example, if you make a decision now, then what you’re looking for is an Inca Trail booking 2019. You can get guides online, such as maps and suggestions according to what you expect to do there. Remember, this is hiking; this is not shopping, or going to the beach. You’re being connected to mother nature. You are getting fresh air. You will exercise. And this is in a high level over the sea, so oxygen is not as abundant as in your house, but still, we’re talking about a once in a lifetime experience. Just make up your mind and go. This is not only to see Machu Picchu. This is an adventure. You can go straight to Machu Picchu by other trails and train, but the Inca Trail is a four-day hiking experience where you connect to yourself, the nature and other cultures more than anywhere else in the world. Well, I already said it before. This is the longest way to see Machu Picchu. This is four days hiking, climbing, camping, going up and down in stone ladders and steps, and being out of oxygen for about 60% of the day. Your feet may hurt, your legs may get exhausted, you may lose a toenail and you may say a few bad words that you’re not used to say every day. If all of these things happen in a trail, then why do people keep doing it? Because once you get to the destination, tears will come out of your eyes. The emotions are so many that you won’t be able to describe the situation once you go back home and your friends ask you about it. And most of the hikers who take the Inca Trail will tell you the same thing: if you take the short way, you won’t understand these emotions that the long-way hikers have. Just think of this place as a hidden citadel (and it is), where Incas would hike for four days straight to get there, and live peacefully. You’re connecting with them, somehow. And if you take a guide with you, try to learn as much of their culture and history as possible. The Sun Gate, the Death Woman’s Pass, the Andes, the hidden treasures, everything’s just worth it, and going by train won’t allow you to enjoy them. And in the way, all the porters will give you so much food you will forget what it was like to be hungry. So, every doubt aside now, it is time for you to decide. Do you want to get this unique feeling? Do you want to connect with an ancient culture and nature? Do you want an adventure? Then this is a hike and a place for you.